After former Peterborough mayoral candidate Maryam Monsef won the federal Liberal nomination by less than 20 votes, runner-up Bob Hall decided to fork over $1,000 for a recount. But first the Liberal Party of Canada (LPC) has to decide whether the situation warrants it. Hall, a former Peterborough city councilor, notes that other federal parties have an automatic recount for contests that fall within 50 votes. From his perspective, having to pay to participate in what might otherwise be an automatic process is less than ideal. Hall’s major concern is that the vote, which was tallied in a crowded hockey change room, was done quickly. He is in no way suggesting that there was any deliberate wrongdoing. The vote was conducted on a preferential ballot basis. 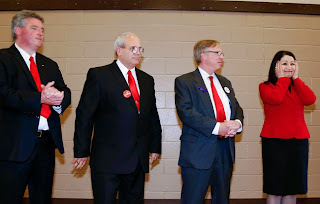 There were four candidates – Brian Cowie and Brendan Moher were running along with Hall and Monsef. Each Party member put down a first, second, third, and fourth choice. Brian Cowie fell off first, then Brendan Moher, setting up the final count between Hall and Monsef. The preferential ballot system can make a count more complex, increasing the likelihood of error. However, the recount itself, if it is called, would be straightforward, and Hall has confidence that that process would be fair. That said, despite Justin Trudeau's claims to the contrary, the LPC's nomination contests are not fully open and transparent. The rules themselves state that a complainant is “not to discuss the appeal or the results of the appeal with the public, including representatives of the press, except by delivering the order or reasons for decision arising from an appeal”. As it stands, the LPC appears to be delaying the nomination in Eglinton-Lawrence so that controversial candidate Eve Adams can sign up more members, thus securing her lead. In Scarborough Southwest, party loyalist and grassroots campaigner Michael Kempa has dropped out in order to give former Toronto police chief Bill Blair an easier ride. Kempa stated that “it was made clear – through joint appearances with the leader, and appearances with other nominated candidates – that the former chief is the Liberal Party's preferred choice to stand as the candidate for Scarborough Southwest.” Former CTV News anchor Tim Weber had already thrown in the towel. As well, the LPC is facing a lawsuit from Ottawa lawyer David Bertschi, who feels that Former Canadian Forces general Andrew Leslie, a Trudeau acolyte, was favored to take the nomination in Orléans, east of Ottawa, where he does not live. Vancouver East is digging out from its own scandal, after people were allegedly signed up for LPC memberships without their knowledge or consent. In Don Valley North, Trudeau-favorite Rana Sarkar looked certain to take the nomination, until the LPC caved to pressure from the Chinese community. Sarker, a personal friend of Gerald Butts, Justin Trudeau’s top adviser, had to drop out. In Bay of Quinte, former Liberal candidate Peter Tinsley was up against Trudeau's preferred nominee, Belleville mayor Neil Ellis. To discourage and disadvantage Tinsley, it appears his “greenlight process” was delayed. The strategy worked. And former Liberal cabinet minister Tony Ianno and his wife Christine Innes are suing the LPC for libel. This arose during the dust-up when Innes was barred from running for the Liberals in a by-election in Trinity-Spadina. The LPC is battling some disturbing poll results in the wake of the NDP’s victory in Alberta and Trudeau’s ill-advised support for Bill C-51. Longtime Liberals are abandoning ship. Nomination contests are intended to infuse a party with energy, not tear it apart. In Peterborough, which is ripe for change after the Dean del Mastro fiasco, the riding could do with a clean slate. Will the LPC deliver? The actual count tally was not made public, though Monsef has said she is "confident the Liberal Party will sort this out".